I consider myself very lucky to have seen The Who live in concert back in the summer of 2000 when bassist John Entwistle was still alive. Roger Daltrey was in great voice, Pete Townshend was windmilling to his heart’s content, and Zac Starkey (son of Ringo Starr) was demonstrating why he was – and continues to be – The Who’s drummer of choice. The Who were touring in tandem that year with The Black Crowes and Jimmy Page. The only crappy thing was that the Crowes had to cancel because of an injury sustained by Page (I’ll never stop being disappointed that I didn’t get to see that show!). But The Who delivered one of the best concerts I’ve ever seen that August night at the beautiful Gorge Amphitheatre in George, WA. Just under two years later, Entwistle was gone forever. Forgive my indulgence in a personal anecdote, but the reason I bring it up is this. I can only imagine how great it must have been to see The Who with Keith Moon, arguably the best drummer in rock history, still behind the kit. 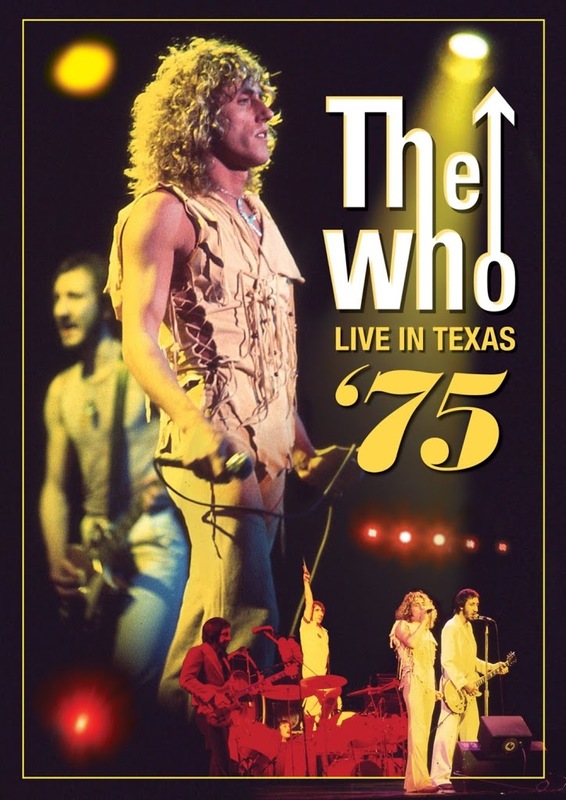 Eagle Rock Entertainment’s new DVD The Who: Live in Texas ’75 offers a priceless opportunity to witness the insanely kinetic rhythmic genius in action for approximately two hours. Filmed on November 20, 1975, the DVD captures The Who on the opening night of the U.S. leg of their The Who by Numbers tour in Houston, TX at the Summit Arena. Keep in mind, the presentation is far removed not only from today’s high definition concert videos, but even the better-filmed concert films of its era. Live in Texas ’75 was shot on videotape from two camera angles. The visuals aren’t pretty. In fact, the image is a murky mess with bleeding colors and occasional pre-Video Toaster effects that are laughably distracting. So you’ve been given fair warning what to expect visually. Don’t let it stop you from seeking out this concert. The sound is similarly raw, but definitely representative of the “live” experience. When Daltrey, or Townshend and Entwistle for that matter, are off-key, you’ll hear it. Some of the time, Townshend’s guitar is frustratingly low in the mix. The 2.0 stereo is functional at best. But again, none of that should be a deterrent to seeing this if you are a Who fan. After years of circulating as a bootleg, this concert has been restored to what I can only assume are the best possible audio/visual standards. At least we don’t have to see any shots of the audience – not even once! The lone Quadrophenia track is “Drowned,” but it’s a killer performance. “My Generation” is played twice, once in its standard arrangement and again as a show-closing blues number (with great vocal interplay between Daltrey and Townshend). Entwistle does “Boris the Spider” (the only tune we get to see much of him during, due to the limited camera angles) after some good-natured teasing from Moon (who has quite a few funny moments throughout). Of course, Who’s Next anthems “Baba O’Riley” and “Won’t Get Fooled Again” are present and accounted for as well. In short, if you’re already a fan of The Who, Live in Texas ’75 is a no-brainer. If you know someone who’s not a fan, this DVD is a good way to convert them.